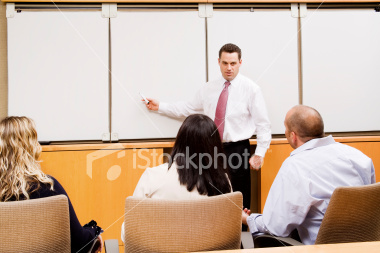 Have you ever had to pitch an idea to an audience but weren’t quite sure how to deliver the message? Well, what if I told you that no matter what you said, people forget 99% of it? How would that impact your pitch? What specific words would you say? And what words would you decide to change? Giving a pitch in front of an audience is a hard task. Fortunately, in a recent talk in my media management class, Suneel Gupta and Leena Rao provided a few tips on how to make a strong pitch and get people to remember. Just yesterday, Suneel and Leena came to one of my classes at Kellogg to give us a few ideas on how to make a pitch to an audience. The class is Understanding Media and Content, and the reason they came is because we have a final project where we have to pitch an idea to help solve a current problem for an existing media company. As former Kellogg (Suneel) and Medill (Leena) students respectively, both Suneel and Leena once took this class a few years ago and had to think about the same project. So they put together a presentation and gave us tips on how to be successful. The first tip they gave was to identify the problem. That not only means telling the audience what the issue is but also connecting them to that problem. They used an example video that discussed managing your finances, and the speaker got to the heart of the issue very quickly by talking about a problem that resonated with all of us very closely. The second tip they gave was “Show me.” “Show me” means showing the audience what you’re talking about. While descriptions can often be powerful, the idea was showing the audience with a live demonstration can be very powerful, especially if the subject matter was technical in nature. The third tip was to simplify. That the best messages are often simple rather than complex, and that they tend to draw on things that people already know. Which leads me to the final point; anchor the audience in what they know. After sharing these tips with us, a few teams were selected at random to practice giving their pitches. One of those teams was my team, and we pitched the idea of bringing Barnes & Noble to the digital world. I took the lead for my team and spent most of my time focusing more on the story to engage the audiences attention. In the end, not only was it a good way to hep improve our final projects but it was also good lesson in making pitches, which I suspect many of us will do a lot of upon graduation. Thanks Suneel and Leena! Where Are Classmates Going After Kellogg? For better or for worse, I’ve noticed that a lot of people have been wondering what their classmates will be doing for the summer. While some classmates jump at the chance to tell the entire world about their offers, others are a bit more tactful in their approach, and another group isn’t quite sure yet. But no matter which of these groups a students fits in, it’s likely that he or she has a sense of what industry they might end up in and further what geography they’ll be at for the summer. To estimate where people might end up geographically, I thought I might try to do a few back end calculations to see where people have historically gone. 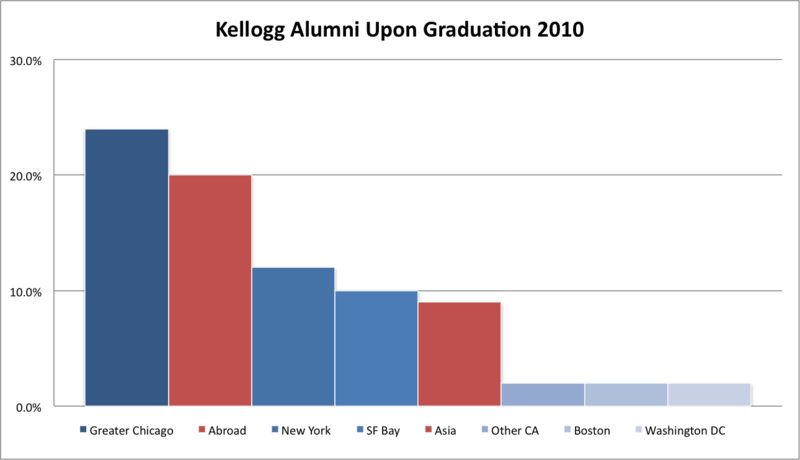 I did that by calculating the percentage of students who have left Kellogg to go to various places around the US and internationally. And I did that not only for 2010 but also for the past 10 years to see if things have changed over time. Below is the 2010 graph and below that is the 10 year graph. From the graph above, you can see the most people head to the big geographies in the US – Chicago, New York, and the Bay. It’s not surprise that more people stay in Chicago than anywhere else given close ties to local CPG firms and given the fact that Kellogg is conveniently located here in Chicago. Likewise, it’s not surprise that New York and the Bay are in the top as well, given those geographies generally send a lot of people to business school. Further, it’s also no surprise that the Bay comes in below New York, not only because New York is significantly larger in size (ie more students) than the Bay but also because Chicago doesn’t have the same reputation for innovation that the Bay, Boston, or even New York has. Strangely the data from 2010 and from the past decade are nearly identical. The only exception is the international data, where the percentage of students that went “Abroad” and went to “Asia” were a little higher last year than usual. Perhaps it’s because the recession took away jobs locally in the smaller U.S. cities, so graduates decided to work internationally instead. (Click here to see MSNBC article that shows that MBAs are flocking to jobs in Asia). 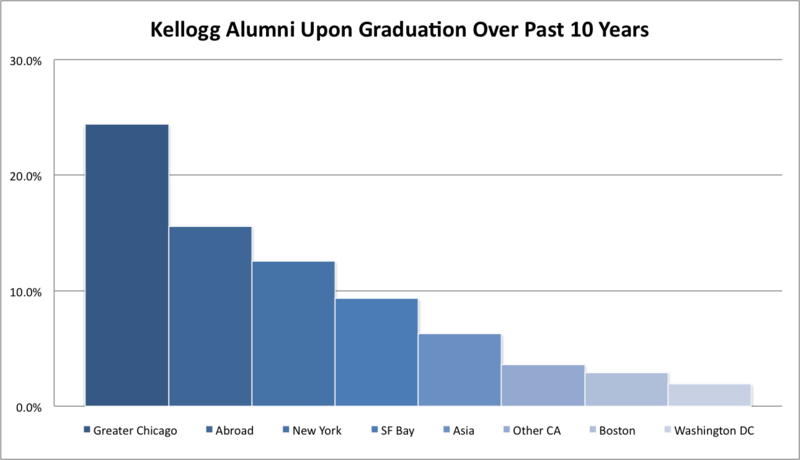 It might also be a result of the fact that the 1Y program at Kellogg is growing, so more students are opting to abroad now than before. The idea that 2010 and the historical data are similar has some interesting implications, given that top business schools brings in new people with new interests and new career ideas every year. The first question that comes to mind is “Is business school just a factory?” Do the same people go to the same employers every year, not matter what you came in thinking you wanted to do? Which leads into the second question? Is geography-changing (or better yet career-changing) a lot harder than applicants think? And do people have less options than they hoped for, even at the top business schools? But maybe I’ve got it all wrong, and it’s actually just the opposite. That people really want to go to these places and business schools provide the venues for them to do so because of access to so many alumni, networks, and employers. This idea makes a lot of sense too. Either way, despite all the noise I hear in business school about changing yourself and changing the world, the statistics should make you wonder if things really do change, or if things really just stay the same year to year … and decade to decade? Perhaps I should continue my analysis by calculating the numbers of jobs the same way I did geographies. I suspect it’d turn out to be exactly the same as this one. What do you suspect? 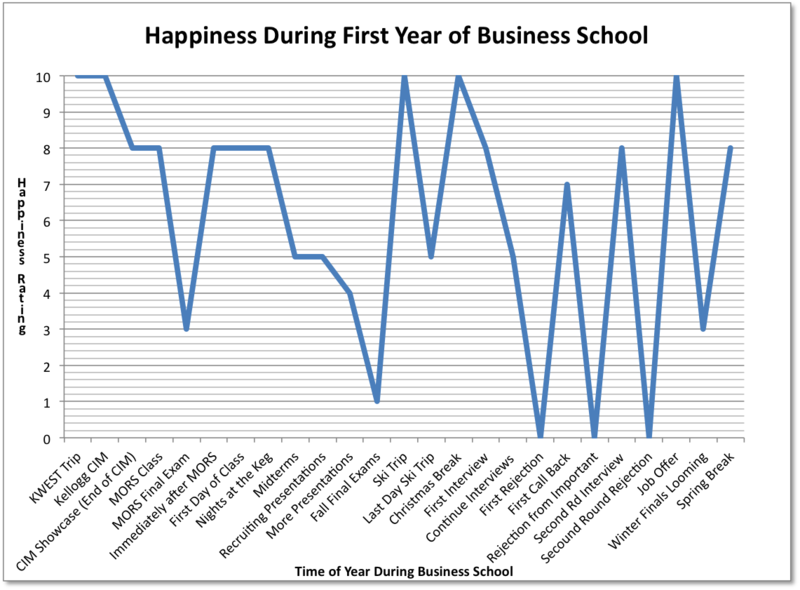 The first year of business school is filled with ups and downs. Everyone starts out very happy, as they’re excited they got into school and look forward to meeting their new classmates and friends. 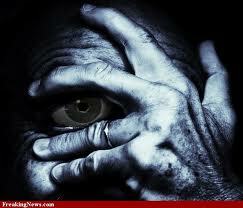 But the last few weeks I’ve noticed a disparity in the way that different people are feeling. Some students feel like they’re on top of the world because they’ve done well in classes or they’ve recently landed the job of their dreams. But there is another group of students that hasn’t had quite the same luck. At least not yet. To quantify some of those ups and downs I decided to sketch out a graph the reflect an approximation of the average level of “happiness”. I did that by listing a few of the noteworthy events from Kellogg on the X-axis, and rating each event from 1-10 based on what the average student might be feeling at that point and time. The graph starts at CIM week (ie orientation week) where students are still happy they’ve gotten into school and were able to quit their jobs early to revel abroad for the past few weeks. They arrived in Evanston from all over the country ready not only to make lots of new friends but also ready to take over the world and become tycoons in their respective industries. But then things like midterms, finals, recruiting, and winter snowstorms hit and things got a lot tougher. Fortunately, things like Ski Trip, TG, and job offers (for some) mitigated some of those downs. The goal was to have the graph capture some of those changes. But more important than the actual ratings, I think the graph highlights the trend of ups and downs that students tend to go through during the first year at business school. Not only will some students agree with the trends of the graph, but I suspect most will be able to relate pretty well with it. Hopefully most of my classmates and fellow MBAs are navigating the process and making their way back to the upper levels of the 10 point scale. For the record, the graph is not meant be comprehensive. Likewise, it’s not meant to be a representation of my experience nor any of my specific classmates. Instead, it’s simply meant to highlight the trend of ups and downs, and reflect some of the sentiments of the average MBA student, not only at Kellogg but a majority of top business schools. Have something to add? Please feel free to share your thoughts and ideas. In the midst of recruiting madness, the Kellogg student body elections have quickly stumbled upon us. Two teams have emerged, both with different people, different ideas, different agendas, and different sets of friends. The question everyone must be wondering is, who is going to win? And what will that team do to stand out from the other? As I walk down the stairs at Jacobs, you can see the two sets of teams at work in the atrium. One team brought in coffee, tea and hot chocolate all week, and they took students ideas by posting stick its on their shirts. And the other team was handing out candy while sweet-talking potential student voters in their plastic construction hats. Meanwhile, both teams are making new friends with classmates by the minute and telling them about their ideas for the school. Within these groups, the students have already taken on different roles at Kellogg. Each group has a student that’s running as a president and executive vice president, and each group also has a slate of six vice presidents that will help with technology, academics, careers, finance, and one or two other areas at Kellogg. 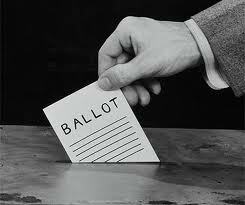 As time goes on it will be interesting to see how the groups take on activities to maximize their chances of winning. And in my view, a couple more specific questions come to mind. Will one group campaign long hours? Will one give away more food and candy than the other team? Will they host happy hours for classmates (come on now, this is Kellogg, you had to expect this suggestion!!) And will they make far-fetched promises that they may not be able to keep? Likewise, there are also a few provocative questions that come to mind. First, why do people actually choose to run for a position at Kellogg? Are the students convinced that winning will be prestigious with classmates or with employers? Will it help them land a job next year, or will it help them in their longer-term political interests? Or was it just something they thought would be fun to do while on campus. But perhaps more interesting than both sets of questions above is the question of what can one slate do that the other wouldn’t have been able to do? Can they actually make change at Kellogg, by improving the new Kellogg building, getting more employers on campus, and getting employers to hire more people for the summers? One recommendation a lot of people have is to eliminate the grading disclosure system. But despite the efforts, that hasn’t changed in years. Don’t get me wrong. 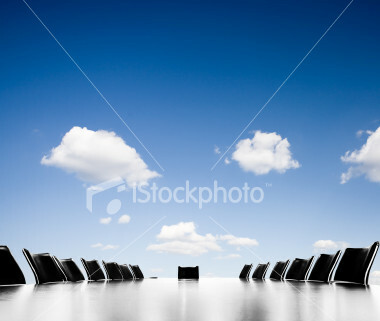 I’m all in favor of getting elected for positions. I consider the process an essential tool to help lead an organization to the next level. In fact, I personally thought about running and a pretty large number of classmates tell me they were shocked that I didn’t. Nonetheless, these questions still emerge during elections and they are some of the ideas that I’ve heard from classmates over the past few weeks. But either way, everyone would agree that running for a position is a noble endeavor. Not only is it a way to help maintain Kellogg superior reputation but also to improve the reputation of Kellogg for the future. Good luck to both of the teams running. And stay tuned to hear how things turn out. Despite the enormous amounts of time we’re all spending with recruiting activities, we all still have to partake in the academic experience of business school. That not only means going to class, doing the problem sets, and taking exams, but it also means choosing classes for the following quarters. While in many cases that are easy, sometimes it can prove to be a bit more challenging, especially for those in the JD-MBA program at Kellogg. With the spring term on the horizon, it’s finally time to bid for spring quarter classes. And we don’t have much time left! Bids are due today at noon, about 30 minutes from now, and a number of us are sitting in the LSR (ie loud study room) right now, figuring out exactly what to do – deciding which classes we want, figuring out what we want to bid on each class, planning our classes to align with our schedules, and submitting are bids in the Kellogg system online. One class I’m considering is Entrepreneurial Finance. On one hand, it’s probably the most popular class here on campus. Taught by professor Rogers, the class comes together every Tuesday night to discuss how to become an entrepreneur and what the financial implications are to the business – business valuation, cash flows, and raising capital. Another class I’m considering is entirely new to Kellogg called Comprehensive Perspectives of Leading a Sports Entity by “Professor” Phillips. Just last year, Phillips became Northwestern University’s 21st director of intercollegiate athletics and recreation, and this particular course explores many of the various departments and constituencies of a sports organization from his perspective. In general, most students hope to have a bit more fun in the spring. After two grueling quarters of fighting through the core, struggling to learn Accounting and Finance, tirelessly searching for summer jobs, and hiking through the frigid cold weather to get to class at Jacobs, it sounds like students want to spend a lot more time enjoying the business school experience in the spring. The scheduling is a bit trickier for JD-MBAs who have less time at Kellogg so have to think about each class a bit more closely. Since we have less overall time at Kellogg than our two year classmates, and since the administration encourages us to get at least one major this year, during our “Kellogg year” we have to be a bit more focused with our class selection. 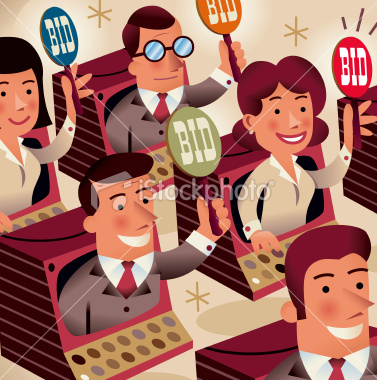 In my case, I’m pretty highly leveraged with my bids. I have one class that will help satisfy two major requirements and a second class that will satisfy a third. Likewise, I also have one class that for me is the one class that I really wanted to get during my time at Kellogg. Hopefully my classes work out for the best. Stay tuned to hear more about the results. Last week, I had the great privilege of getting my assignment for the Kellogg Board Fellows program. In addition to getting assigned to the education industry, which was my first choice for the program, I’ll also get a chance to work firsthand with an innovative charter school in the Chicagoland area, name Cristo Rey Jesuit High School. I look forward to the upcoming months, where I’ll have the chance to see first-hand how leaders in the field are taking action and also see what their thoughts are regarding the future of the education industry. 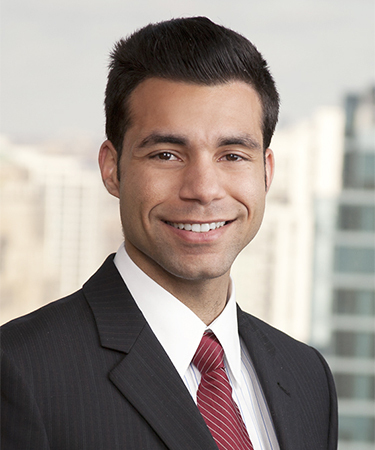 The Board Fellows Program here at Kellogg is a fourteen month program, that matches Kellogg MBA candidates with the boards of directors of nonprofit organizations and gives them temporary board appointments. Fellows attend the various board sessions, take part in some of the committee meetings, and usually have the opportunity to complete a strategic project for the organization. There are not really typical projects for the program but past projects have revolved around Board governance, fundraising, goal setting, and strategic planning for the organization. And over time everyone takes unique roles depending on the needs of the specific organization. In addition to gaining real-world experience on a board of directors, students also enroll in two nonprofit board governance course here at Kellogg – Nonprofit Board Governance and Advanced Board Governance. Together, these courses offer the fellow an opportunity to study boards, understand current trends, discuss our own experiences, and in the end learn how to become an effective board member. My specific organization is Cristo Rey Jesuit High School, located in Downtown Chicago. The mission of the school is to”offer a Catholic college preparatory education for the immigrant families of Chicago’s near southwest side.” And in practice, the school takes kids that are usually the first in their families to obtain a college degree and also helps them with summer internships. While I haven’t actually met my organization yet, on the surface it sounds like exactly the type of organization I was looking for. Not everyone here at Kellogg applies to be part of the Board Fellow program, but an increasingly large number of people do. Because in business school, a lot of people understand this there’s more to the overall experience than learning finance and strategy but that it’s also important to think about community and social enterprise. And fortunately, there are great programs like the board fellows program that can help up and coming business people to quickly get engaged in that process. And in my view, the best leaders know, that social enterprise is critical. That a leader’s job is not only to maximize profits and negotiate deals but also to help build the communities around them. And when they do, these communities will thrive and build up the up-and-coming leaders that will be inspired to do the same. And in the end, these classes,meetings, and MBA Board Fellows Programs across the country will definitely help to make a difference. Winter Quarter is Flying By! Today is the start of what will be a long few weeks. As I’ve been mentioning in my most recent entries, this is one of the busiest times at Kellogg. Recruiting season is in full swing and final round interviews necessitate traveling to other cities. Likewise, the academic quarter is also flying by. 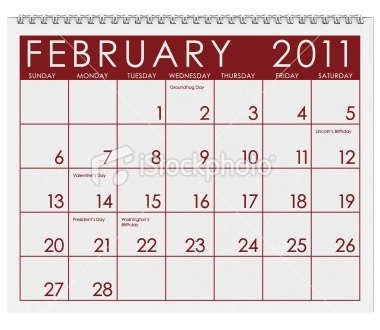 The Kellogg quarter system means classes go by faster and given we’re already in mid February, that means we’re entering the seventh week of school and final exams are coming up soon. The one on most of our minds in Microeconomics, better known as MECN. For one, microeconomics isn’t the most provocative topic. Two, it’s also not as relevant as finance, marketing, or strategy in terms of helping people with their job searches. Further, most of us have also had to miss a few classes due to interviews and other commitments, so we have a lot of catching up to do. And finally, many of us are also balancing this class with statistics two(ie DECS) and finance. But in spite of that, some people haven’t spent much time in their textbooks this quarter, because recruiting demands a lot of attention. Fortunately for some, it looks like the summer job process has recently finished. These people have already sent off their paper work and informed other companies that they were dropping out of the recruiting process. For others, that’s not the case. Some have been fortunate to receive one ore more offers but are still thinking a lot about their options. And a third group, is still proactively searching. Among those, some haven’t found jobs yet and others may have found jobs but not the job they really want. In the end, one theme that continues to re-emerge is that the quarter system is fast, and everyone here is pretty exhausted. While on one hand, it’s great to have the opportunity to take more classes and get more experiences throughout the year, on the other hand, you often can’t find enough time to invest in them and in the end you have to cram just to catch up. Similarly, you have to make more tradeoffs given the workload, especially if you’re still looking for a job. Either way, it’s been a long quarter and most of us can’t wait for spring break, not only because it means the quarter will be over but also because the sun will re-emerge and all of us get to go on GIM (click here to read my prior post on GIM), the one class that’s still lots of fun. Stay tuned to hear more about my trip to Kenya in March. To the applicants admitted to Kellogg’s Class of 2013 who are here for Day At Kellogg, otherwise known as DAK, welcome to Evanston! Hopefully you are excited about the opportunity to meet potential classmates, learn more about Kellogg, and decide if this is a place you want to call home for the next two years. Likewise, congratulations on your achievement. For many of you, the journey to Kellogg and to Evanston has been long. Choosing to come to Evanston this weekend is definitely the right choice. It’s a chance to come see if this is a place you can call home. If the culture, energy and dynamism is a place that feels like a good fit for you. Meanwhile, be sure to speak with the students you get the chance to meet. Elicit their perspectives. 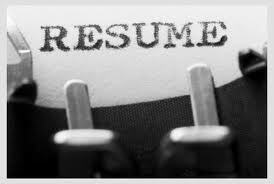 Hear about their successes with their job search process, and also their struggles. See what clubs they lead and which ones they wish they could lead. And hear about the opportunities that they’re currently pursuing. And above all, engage! One thing we learn here in business school is that the experience flies by. Not only because two years is a short time period, but also because there are dozens of competing priorities at any given moment, all competing for your attention at the same time. Friends, assignments, networking events, recruiting, exams, club activities, and taking part in activities outside of Kellogg, just to name a few. Likewise, the weekend will probably fly by quickly for you. So along with the great opportunity to come to Kellogg and take a break from work for a few years, you still have to constantly engage and do your best to optimize your experience. Hopefully you’ll start off by engaging in the activities at DAK this weekend. Best of luck during your visit. And as I mentioned in my previous post, feel free to say hello if you catch me around Jacobs. “Yeah, I don’t really care how well I did. I don’t think anyone does. I can just make it up on the final exam.” These were the words I overhead during a conversation the other day. They were in reference to a midterm exam I had just walked out of. The midterm was pretty difficult, not only because the material for the class was hard but also because time to study was much more limited than normal, as right now, we’re right in the middle of recruiting season. But don’t be fooled. This conversation is not as unique as it sounds. The trade-off between grades and other activities has long been an important discussion in business school. Both because grades have never been the sole focus of school and because in the winter quarter, priorities start to change, and recruiting becomes the main priority. 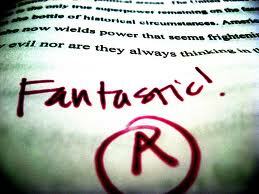 But that must leave you wonder … so how important are grades at Kellogg? On one hand, many people agree that grades don’t matter all that much. After all, most employers rarely ask you to submit grades and even if they do, it’s only one data point along with your resume, background, interview skills, and prior experiences, not only on campus but also before Kellogg. On the other hand, most people here are used to doing well academically, so still want to do as well as possible. Similarly, you do get a sense of personal satisfaction from doing well in a class, especially if you enjoyed the subject matter or liked the professor. From experience, I’ll say that figuring out the right balance can be tough. You have limited time to do everything and you have to start choosing. Choosing if you have to miss a class, and if so when. Choosing how many jobs to go after. And choosing how many classes you can handle, which is likely dependent on your recruiting needs. This process will be especially difficult for those that end up having to go through with recruiting for longer than the average student. They have less time for a longer period of time, have to make more tradeoff decisions, have to engage more overall energy in the search process, and miss out on the traditional parts of graduate school, and business school, that are supposed to be more fun. Fortunately, the administration knows this takes place every year. Some professors allow you more flexible schedules and allow you to come in and out of class if you have an interview looming. Already, two of my professors have noted that alternative arrangements for class can be made if an interview conflicts with the class time. Likewise, alternative arrangements can at times be made to take midterms if there is a real conflict and you let the professor know in advance. Despite this, professors still face the challenge of keeping students interested. For better or worse, we are incented with grades. We are also incented because we can enroll in electives which are more fun and interesting. And some classes make participation a larger part of the process of the process. For most though, this doesn’t necessarily change their mindset, because students won’t spend all their time studying at the expense of getting a job. In the end, everyone figures out the balance that works for them, and they do their best to make it all work. It will be interesting to see how the pulse at Kellogg changes as the recruiting season moves on and more and more people start to accept summer jobs. Good luck if you’re also going through the recruiting process. 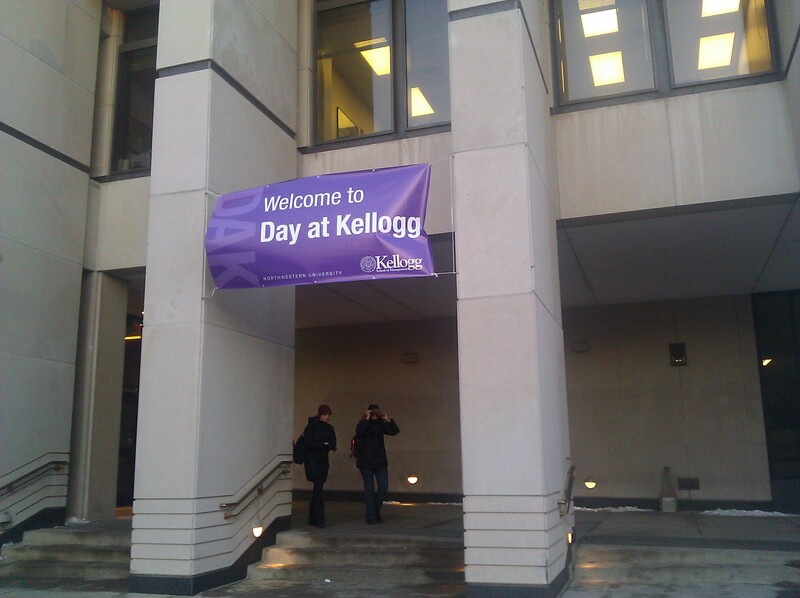 Have you ever wondered what it would be like to be at student at Kellogg? Or what about listening to one of Kellogg’s top professors giving a talk on your favorite business subject? 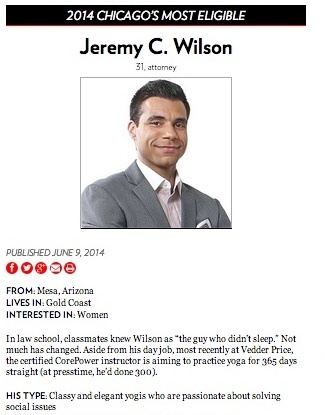 I wondered about those things a lot when I was applying to business school. Well, if you are too, then now is your chance. On Friday February 25, 2011, the Kellogg School of Management is hosting its annual “Sneak Peek” event, where you’ll get a sneak peak at what it feels like to be a student. It’s that time of year again. The time for snowstorms in Evanston. Job interviews in Jacobs. Admissions interviews all over the country. And last but not least, admissions events being held for next years class. On Friday, February 25, the Kellogg School of Management is excited to host another admissions event for minority prospective students. Co-sponsored by the Africa Business Club (ABC), Black Management Association (BMA) and Hispanic Business Students Association (HBSA) Sneak Peak gives you the opportunity to experience Kellogg first-hand. In my personal view, events like this are almost always worthwhile. Not only is it a chance to meet students at a school you might be interesting in attending, but it’s also a chance to meet future applicants, many of which will be applying to the same schools you are, including Kellogg. So even though you’ve probably got a lot on your plate right now – studying for the GMAT, starting applications, preparing for interviews — I’d suggest that you strongly consider taking some time out to learn a bit more about Kellogg. For reference, below is the official blurb about the event from Kellogg admissions, which includes a link where you can register. The BMA Conference will be hosted the same weekend and you are invited to both! Click Here for more information on the BMA Conference.